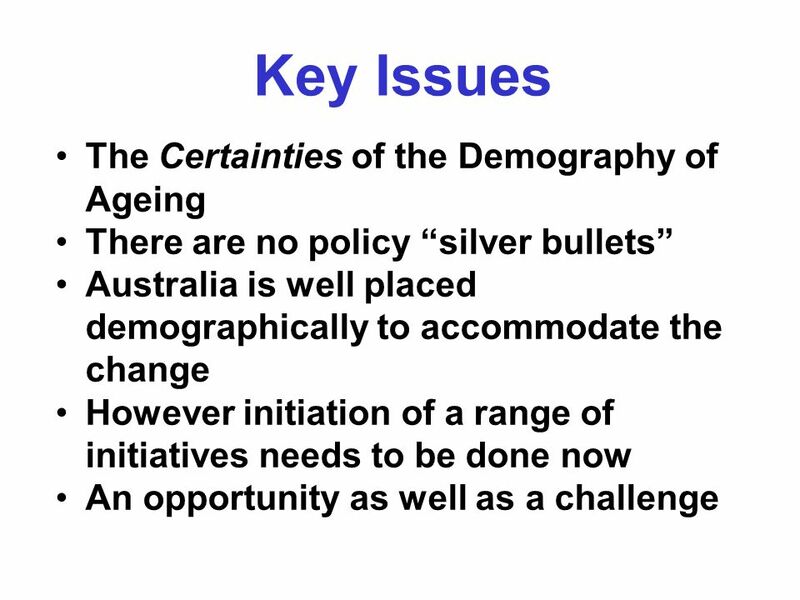 The Demography of Australian Ageing over the Next Decade: Certainties, Surprises and Implications for Government by Graeme Hugo ARC Australian Professorial. 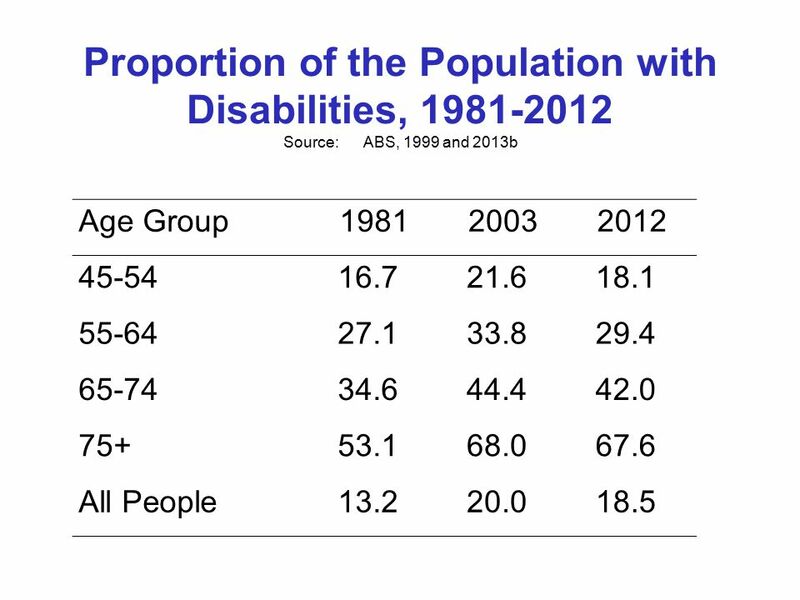 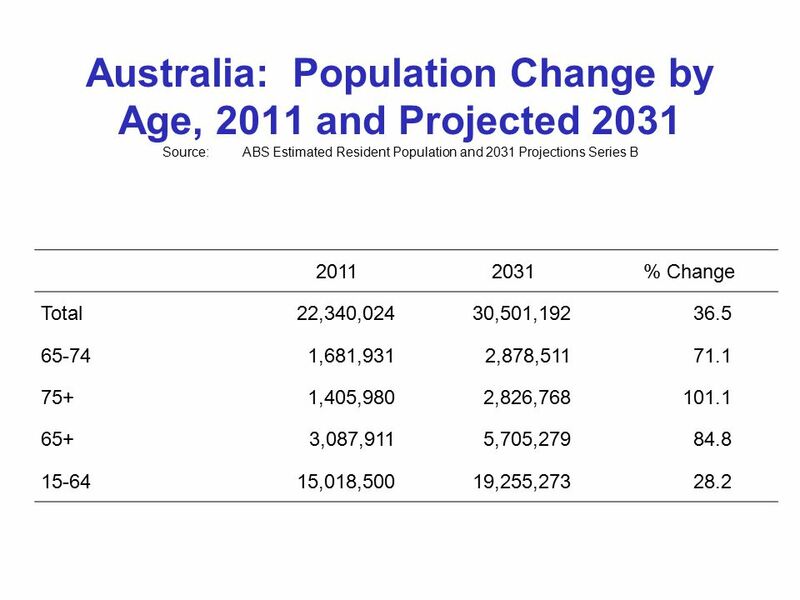 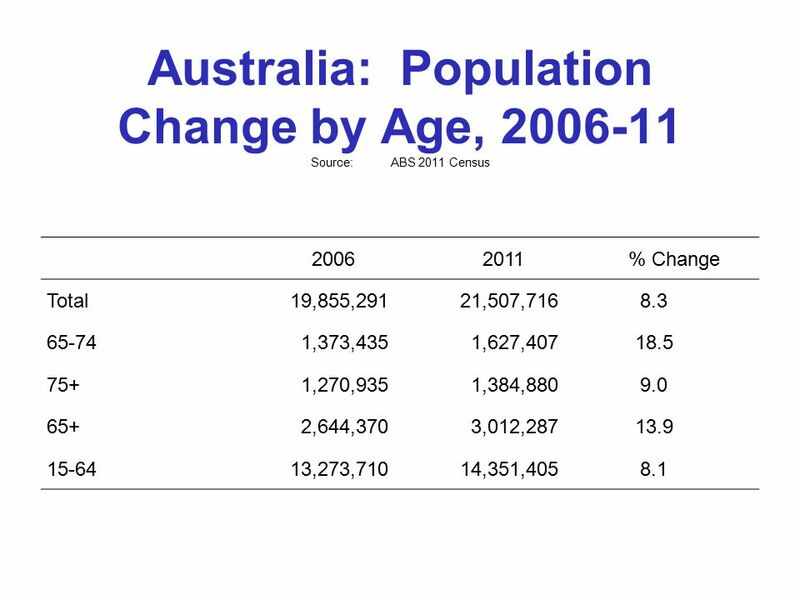 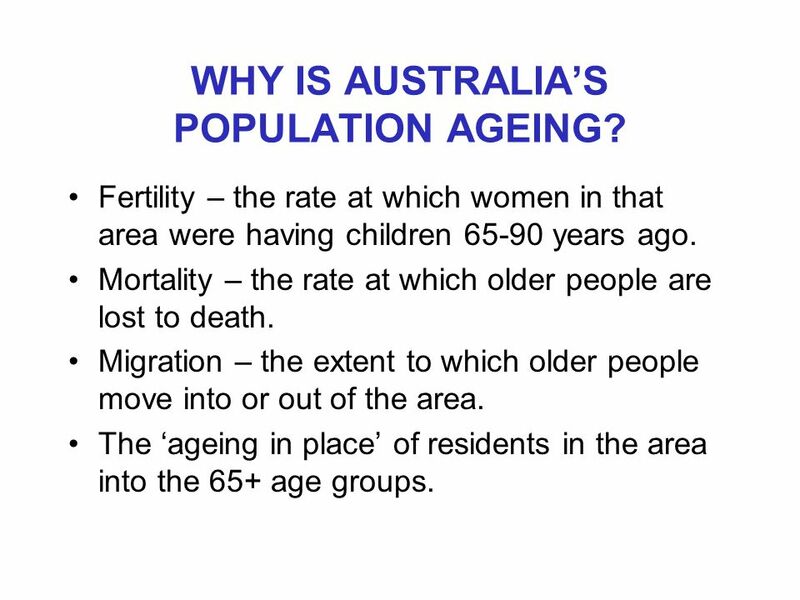 9 WHY IS AUSTRALIA’S POPULATION AGEING? 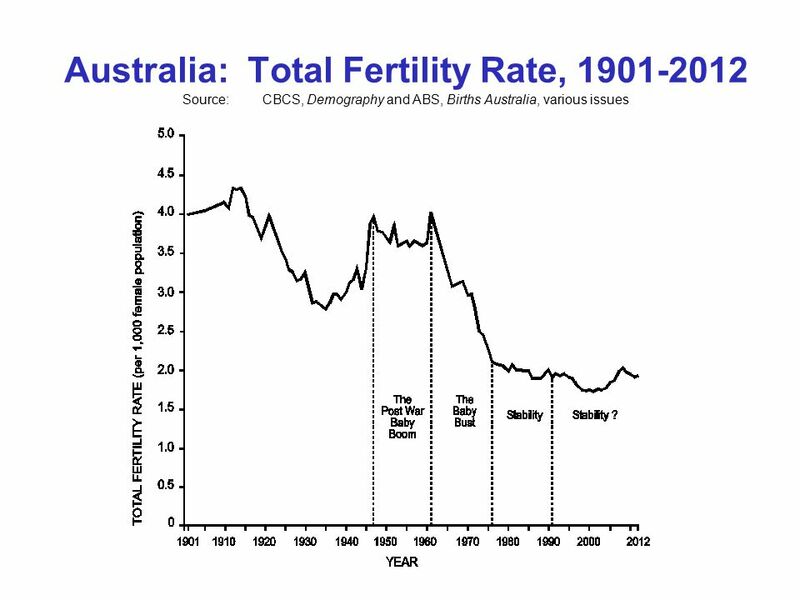 Fertility – the rate at which women in that area were having children 65-90 years ago. 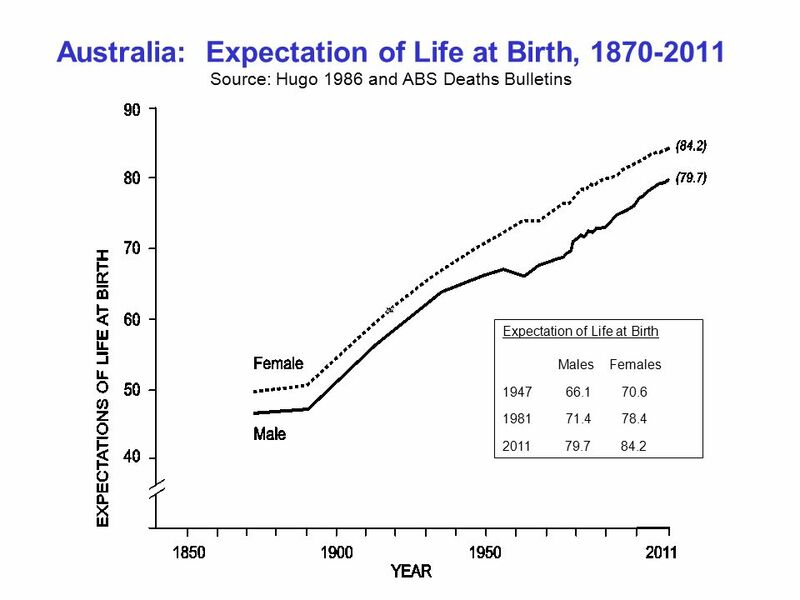 Mortality – the rate at which older people are lost to death. 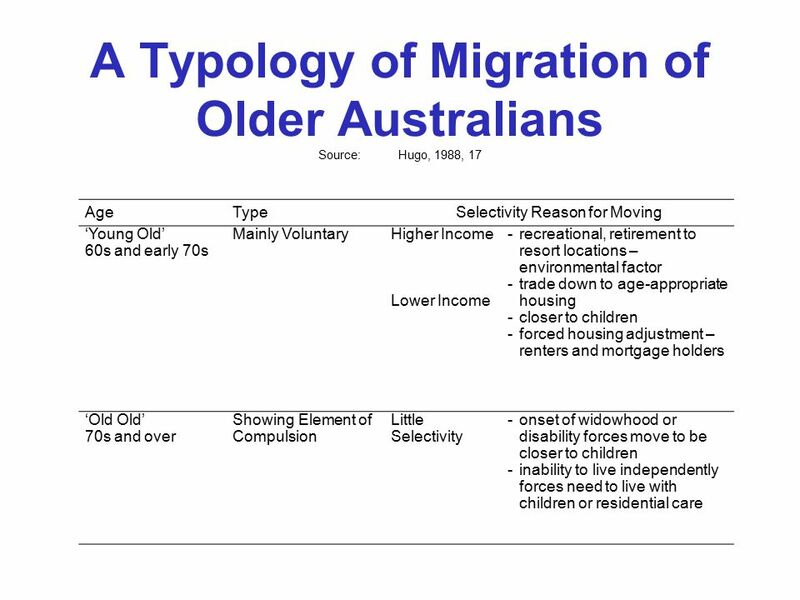 Migration – the extent to which older people move into or out of the area. 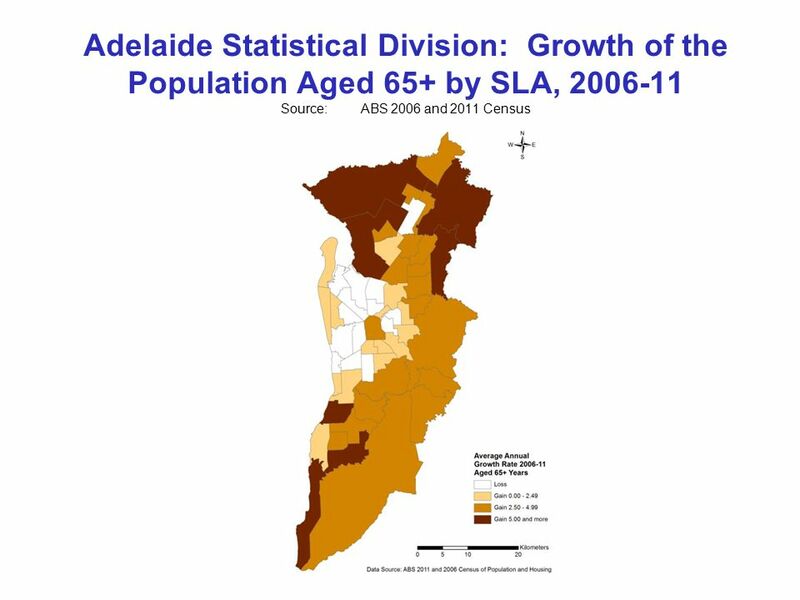 The ‘ageing in place’ of residents in the area into the 65+ age groups. 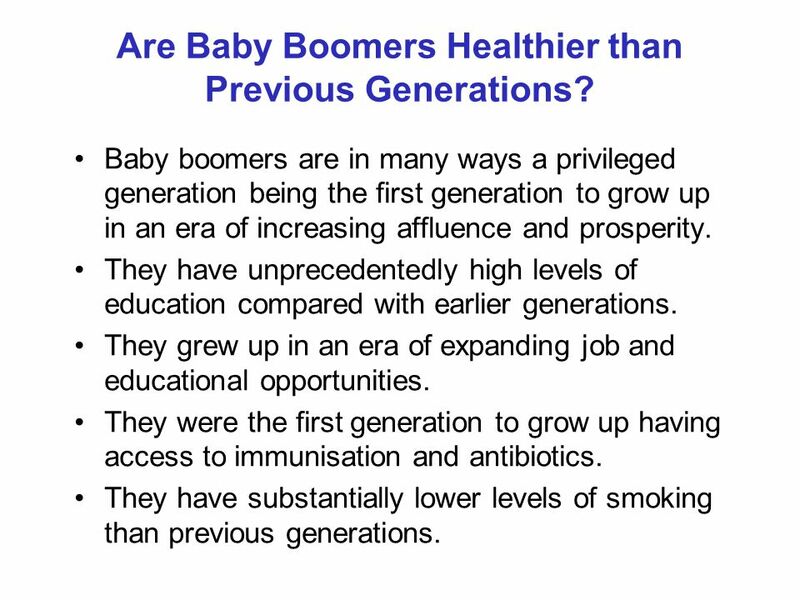 15 Are Baby Boomers Healthier than Previous Generations? 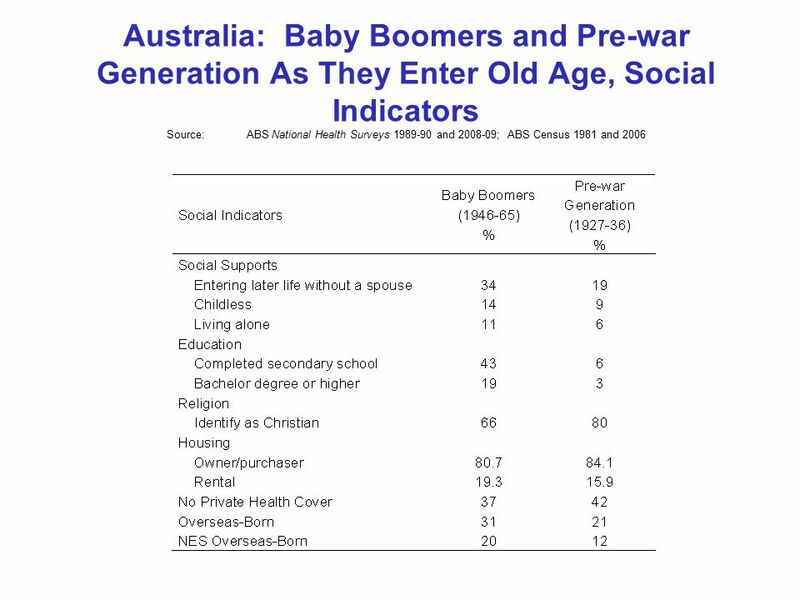 Baby boomers are in many ways a privileged generation being the first generation to grow up in an era of increasing affluence and prosperity. 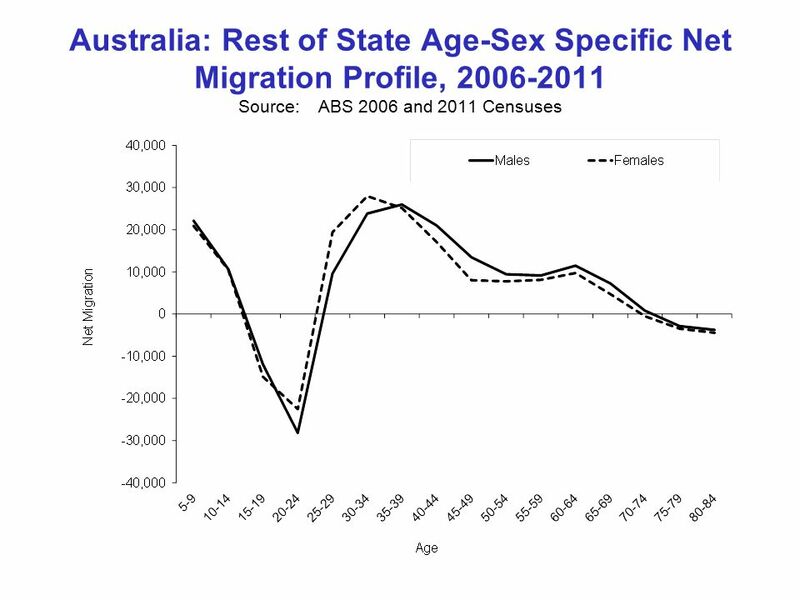 They have unprecedentedly high levels of education compared with earlier generations. 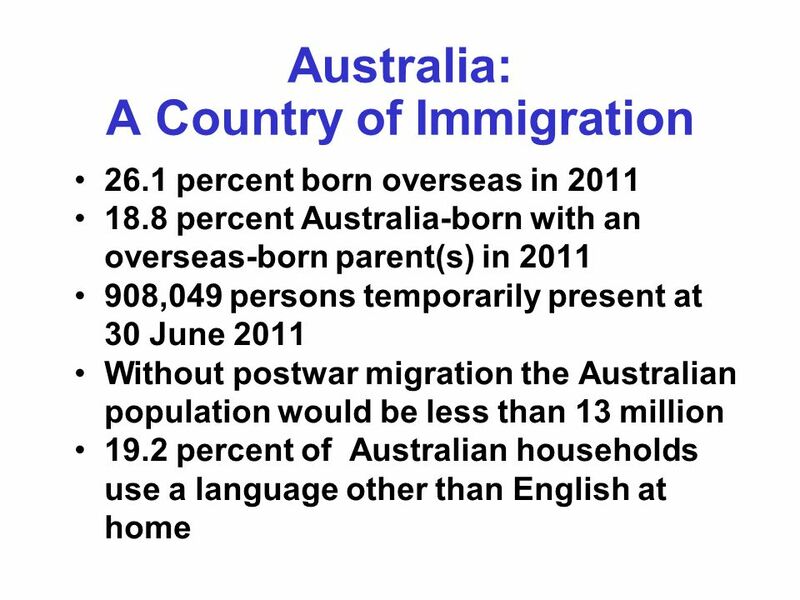 They grew up in an era of expanding job and educational opportunities. 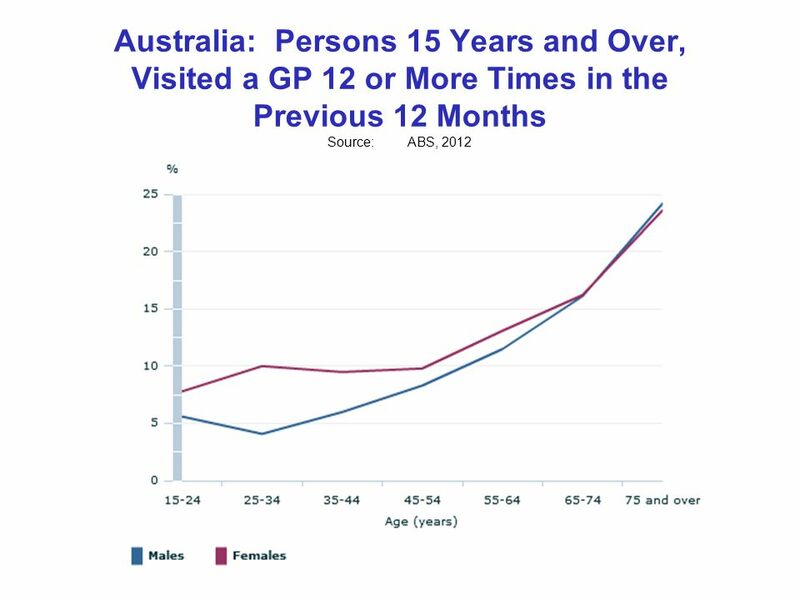 They were the first generation to grow up having access to immunisation and antibiotics. 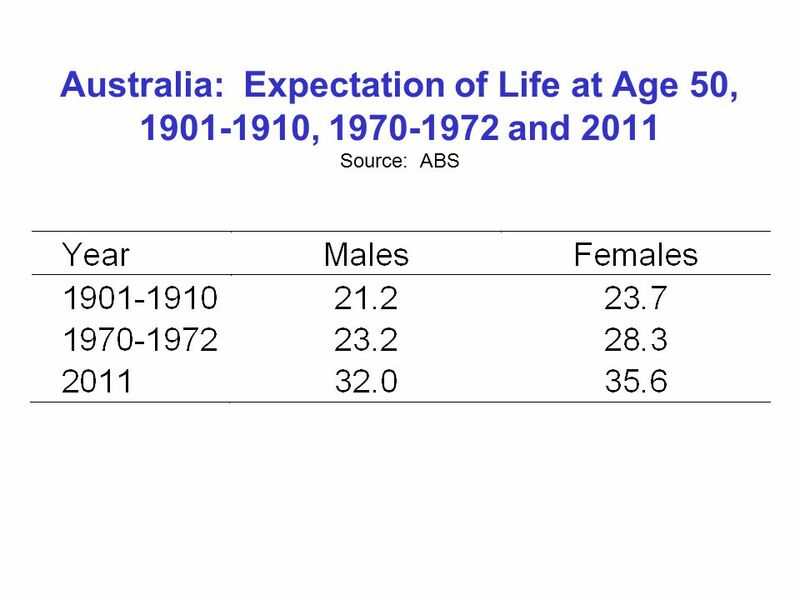 They have substantially lower levels of smoking than previous generations. 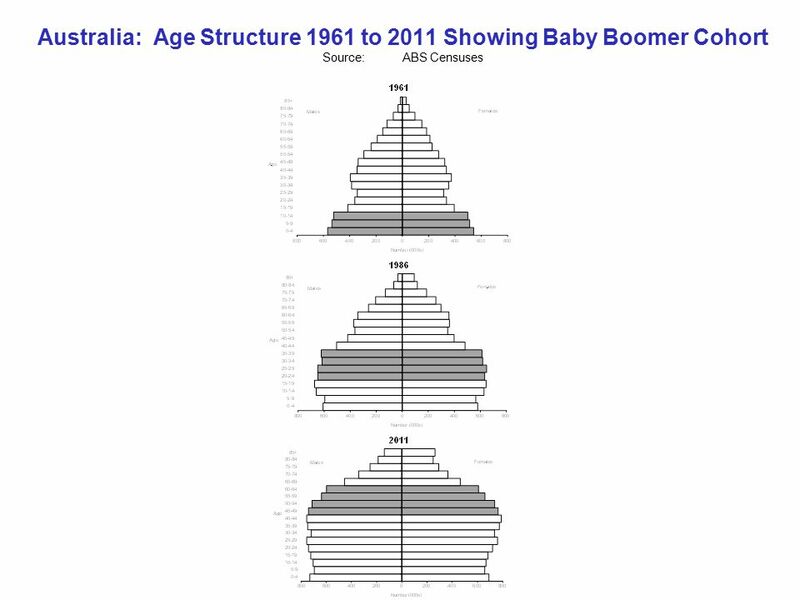 16 Are Baby Boomers Less Healthy than Previous Generations? 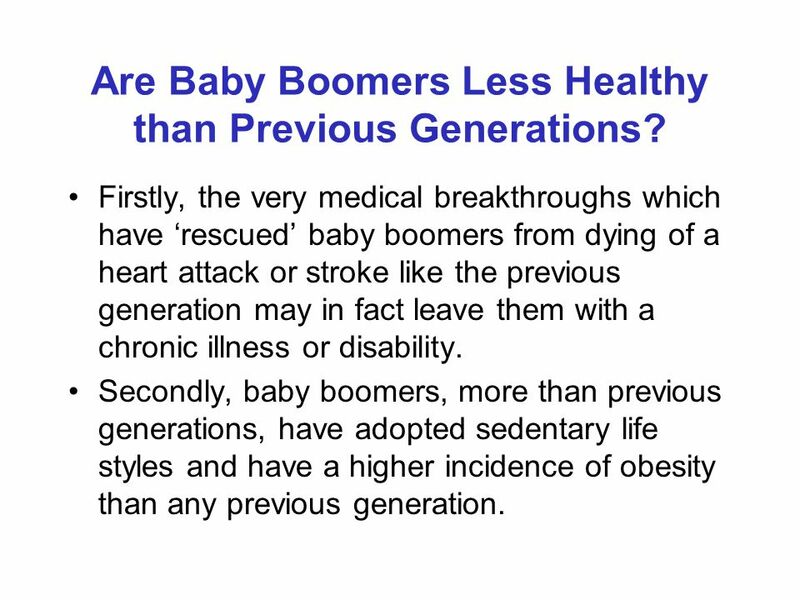 Firstly, the very medical breakthroughs which have ‘rescued’ baby boomers from dying of a heart attack or stroke like the previous generation may in fact leave them with a chronic illness or disability. 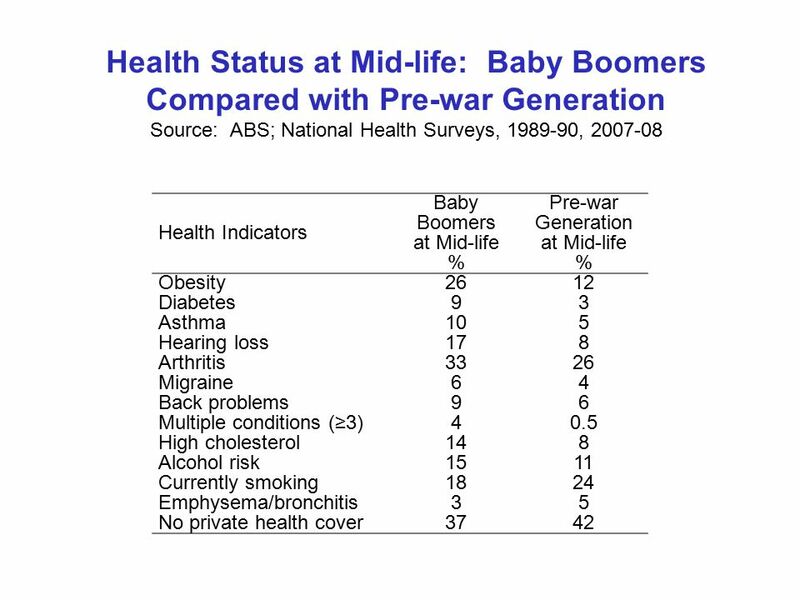 Secondly, baby boomers, more than previous generations, have adopted sedentary life styles and have a higher incidence of obesity than any previous generation. 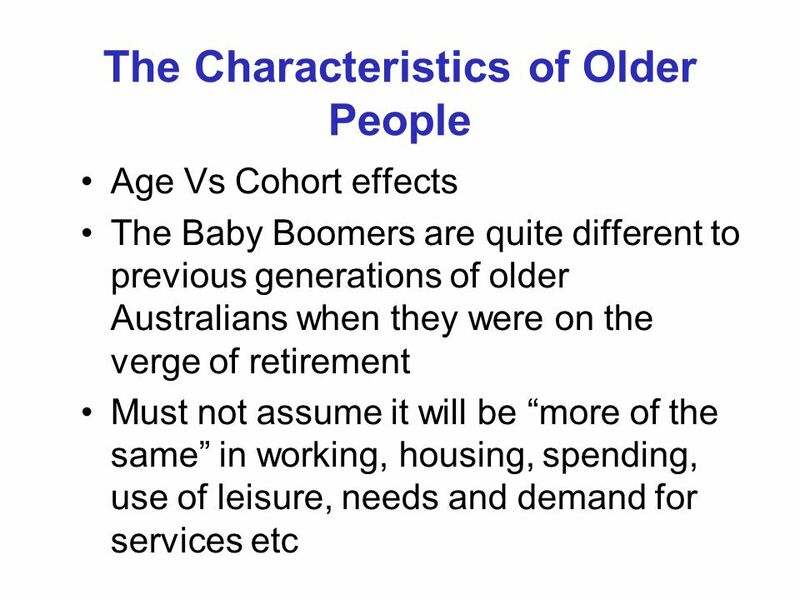 32 Some Key Considerations The extent to which baby boomers will be able to call upon a partner or a child to assist in their day to day care will be considerably less than the previous generation of older Australians. 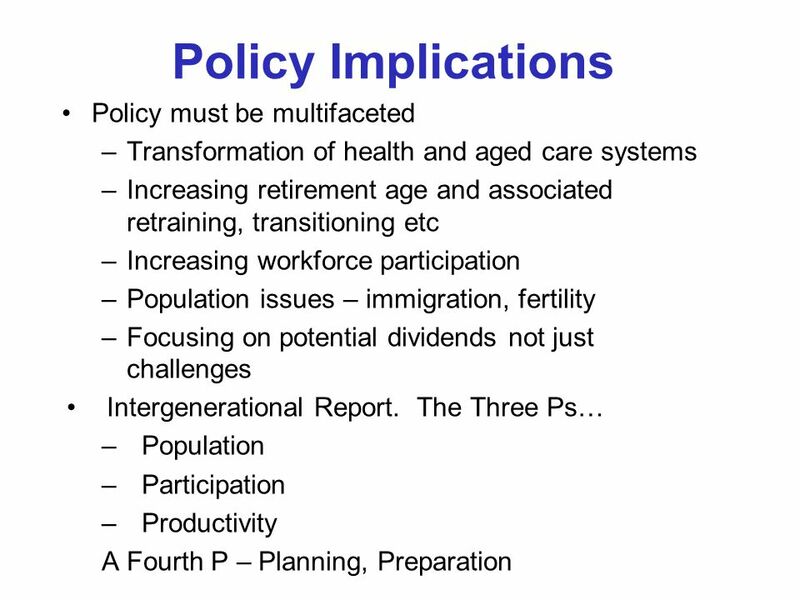 Yet policy is to increase the proportion of care being delivered at home rather than in a residential care context. 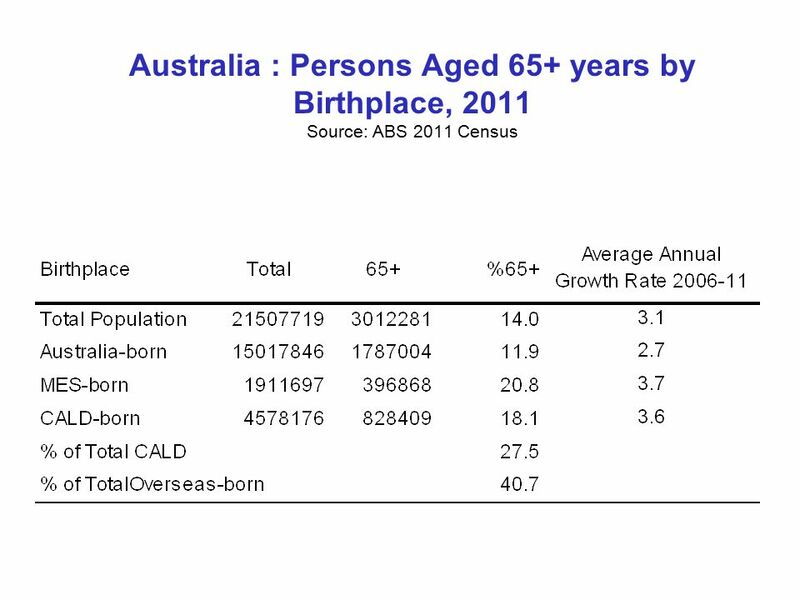 The proportion of baby boomers owning their home outright will be less than is currently the case. 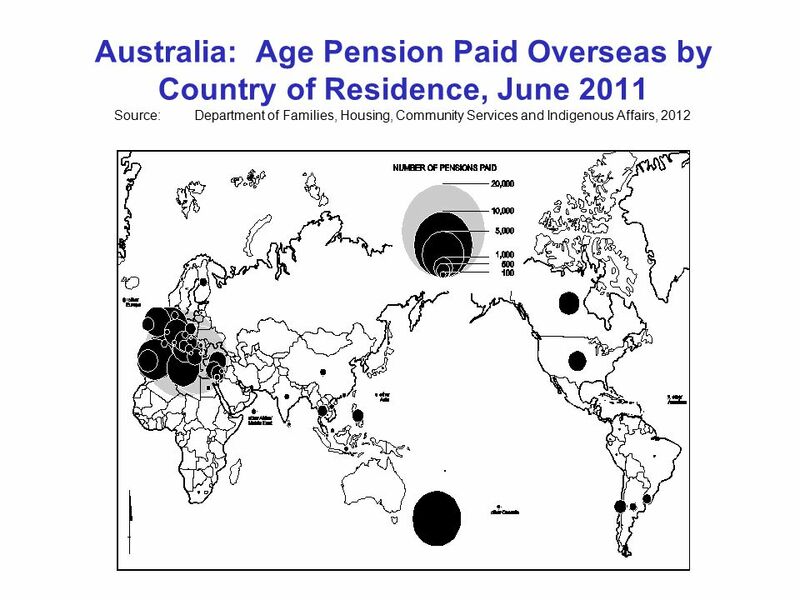 Yet home ownership is one of the three pillars of the Australian aged care system. 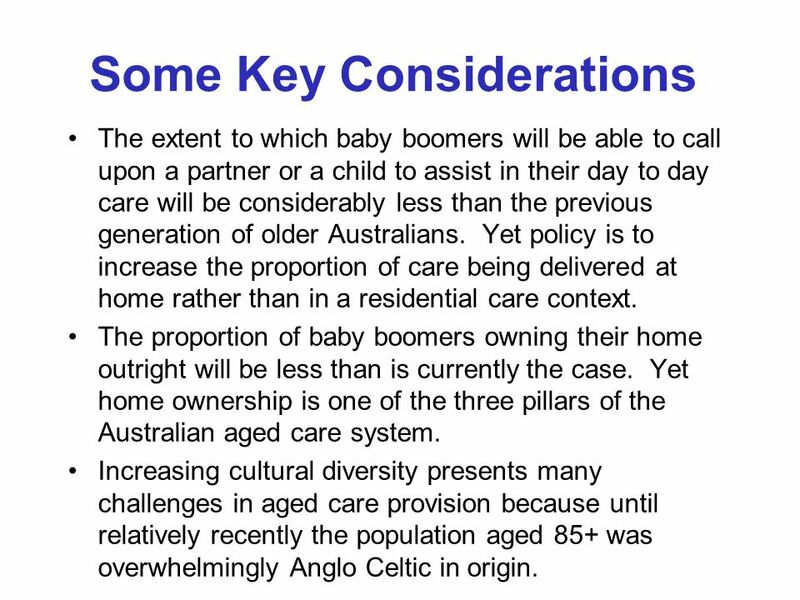 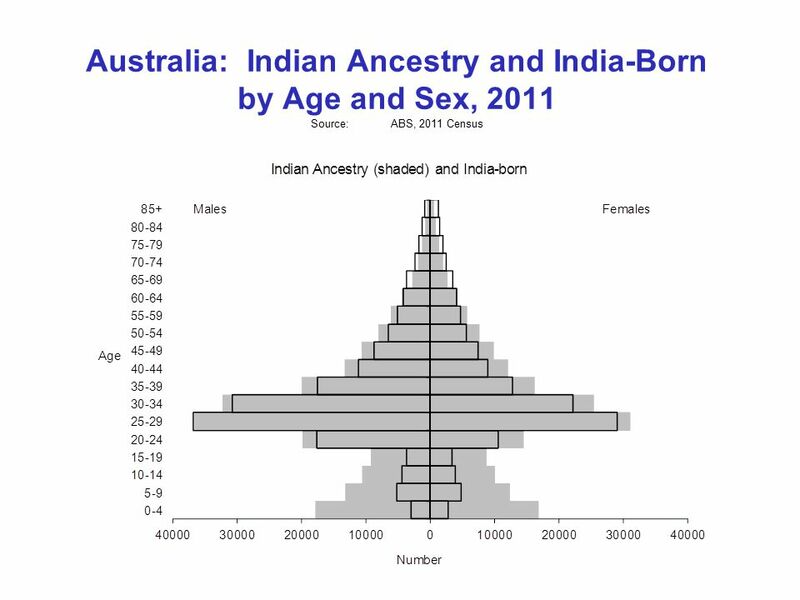 Increasing cultural diversity presents many challenges in aged care provision because until relatively recently the population aged 85+ was overwhelmingly Anglo Celtic in origin. 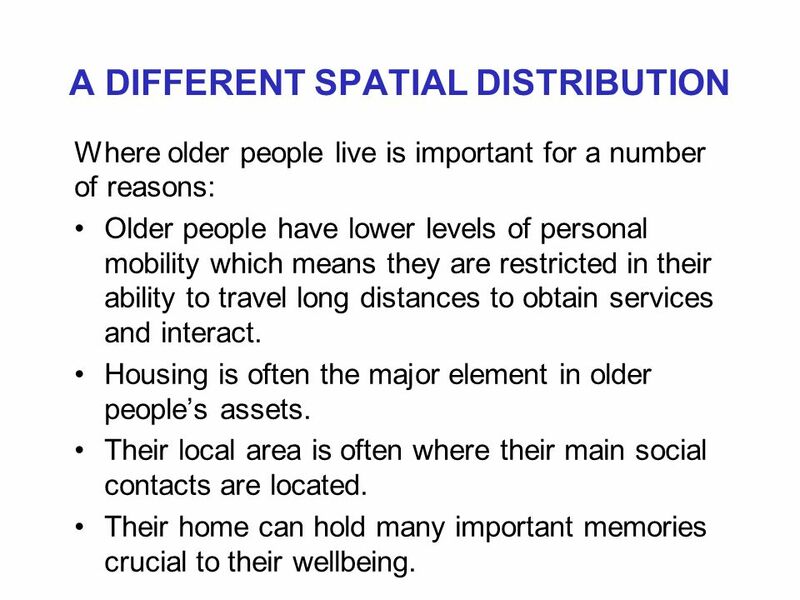 40 A DIFFERENT SPATIAL DISTRIBUTION Where older people live is important for a number of reasons: Older people have lower levels of personal mobility which means they are restricted in their ability to travel long distances to obtain services and interact. 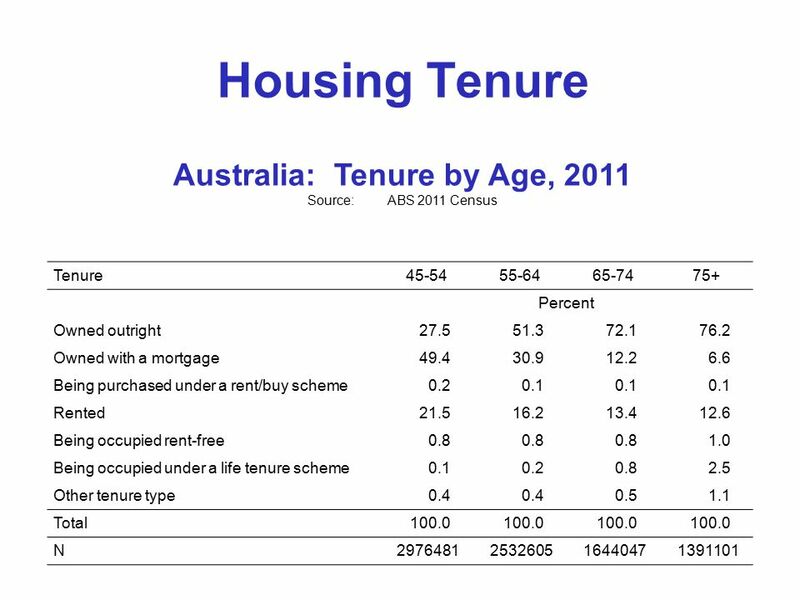 Housing is often the major element in older people’s assets. 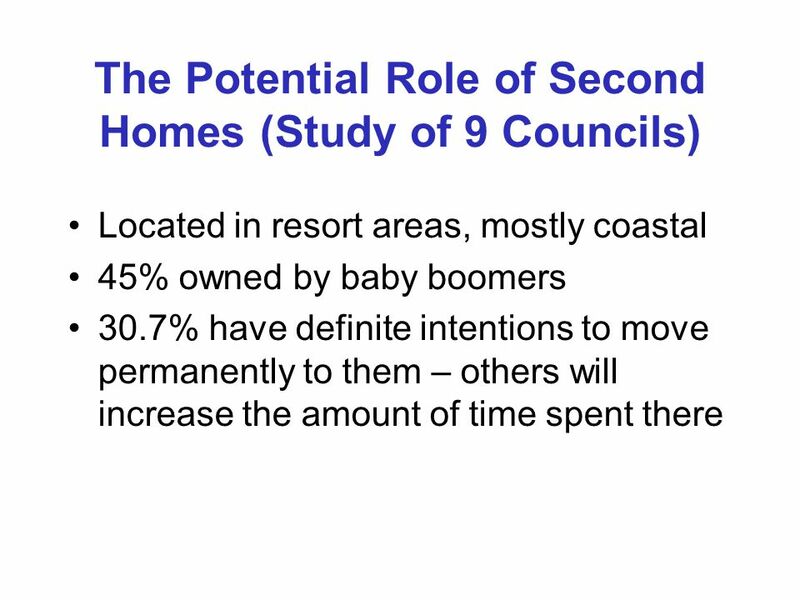 Their local area is often where their main social contacts are located. 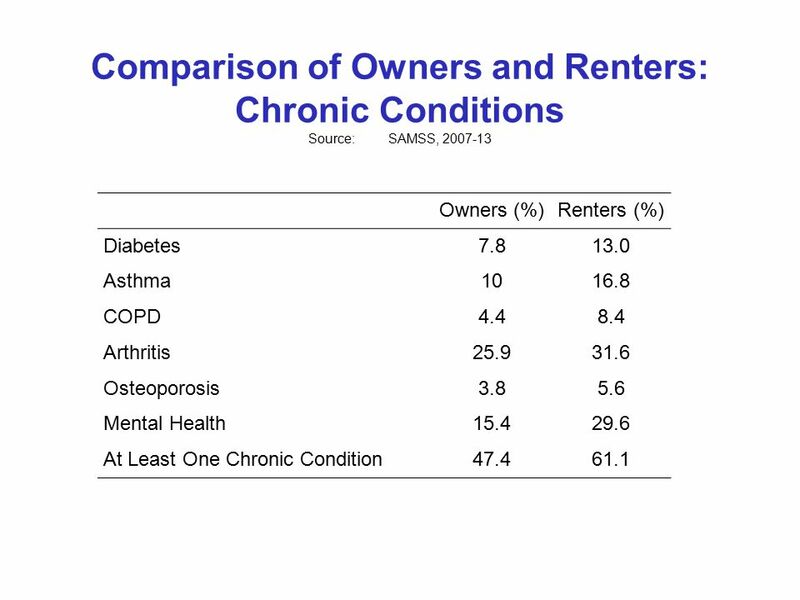 Their home can hold many important memories crucial to their wellbeing. 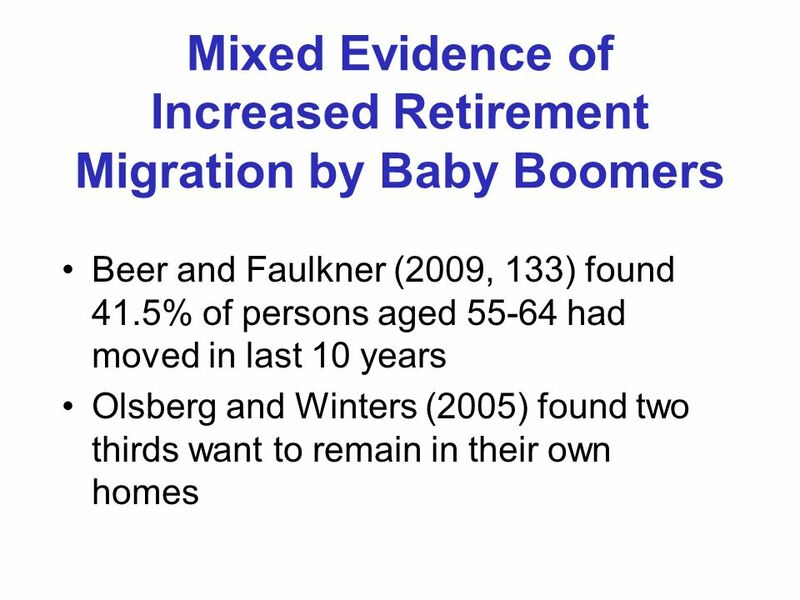 44 To What Extent Will Baby Boomers Move As They Near Retirement? 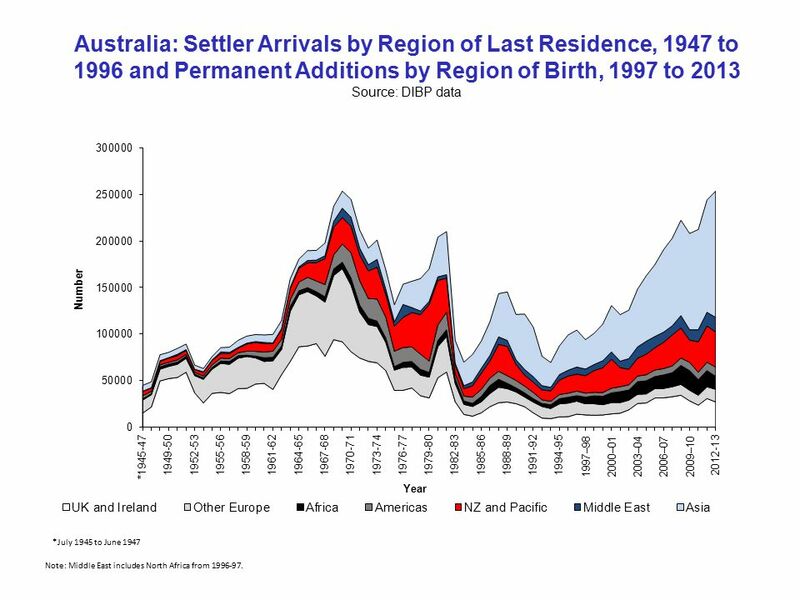 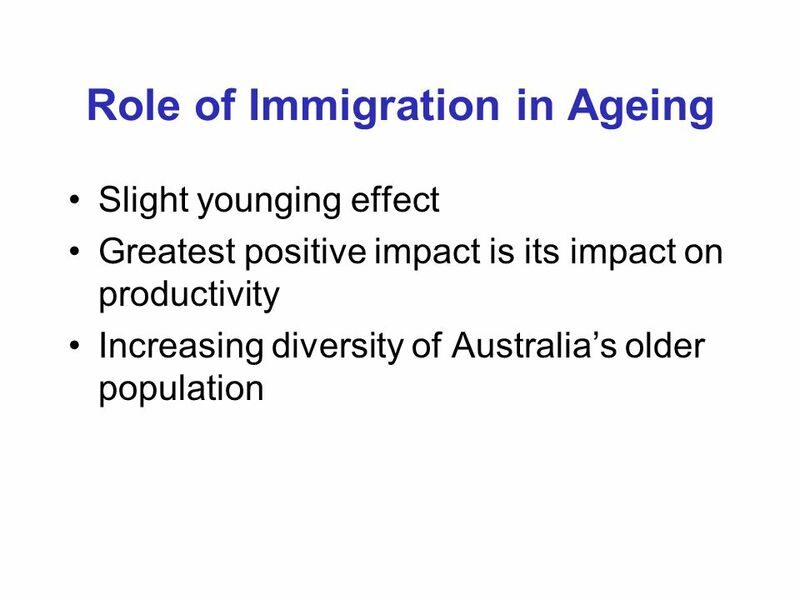 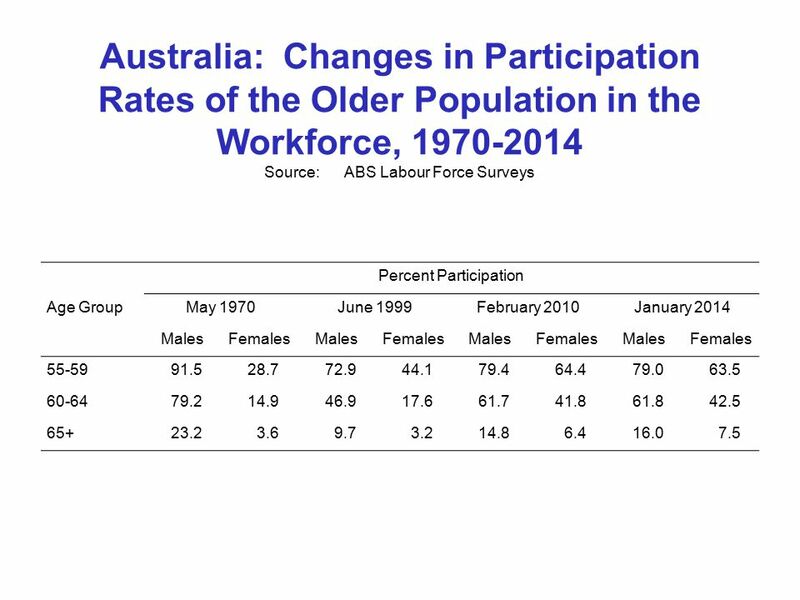 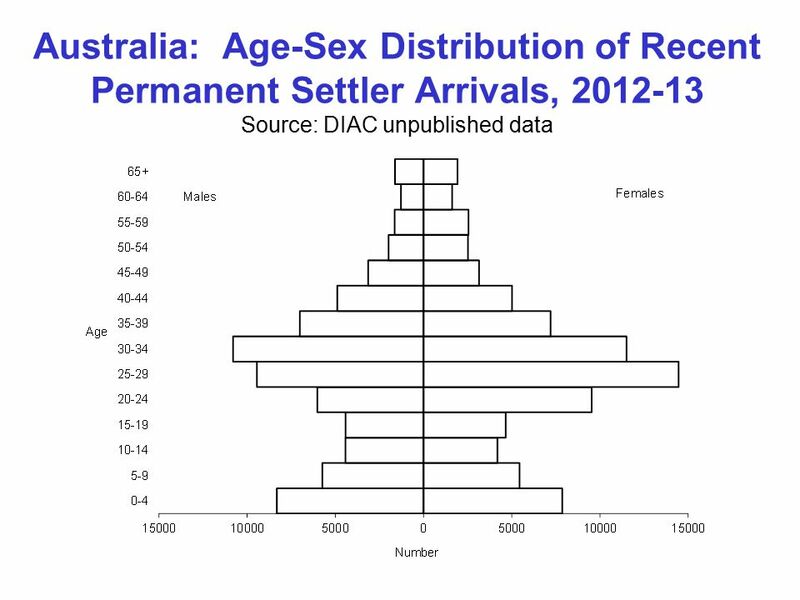 In the United States there is a clear secondary peaking in the age migration profile around retirement ages No evidence in 2011 Australian Census internal migration data Delaying due to increased workforce participation? 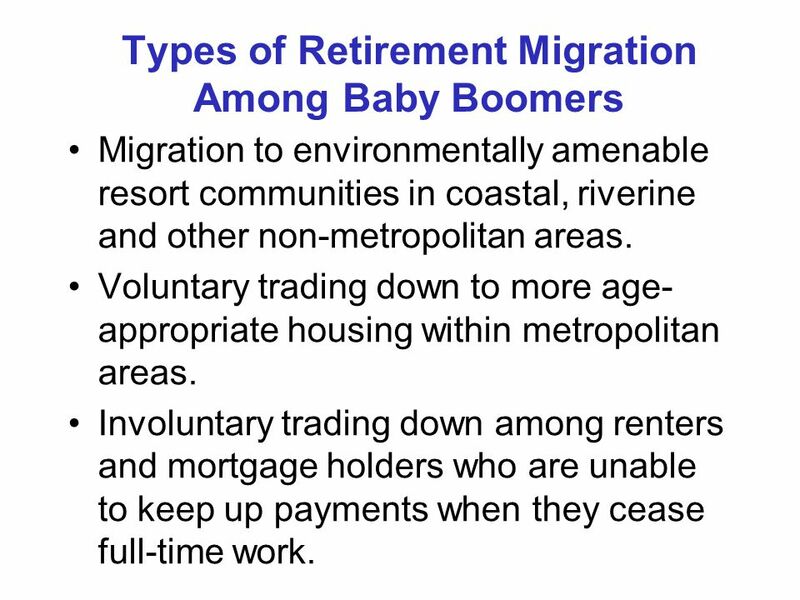 52 Types of Retirement Migration Among Baby Boomers Migration to environmentally amenable resort communities in coastal, riverine and other non-metropolitan areas. 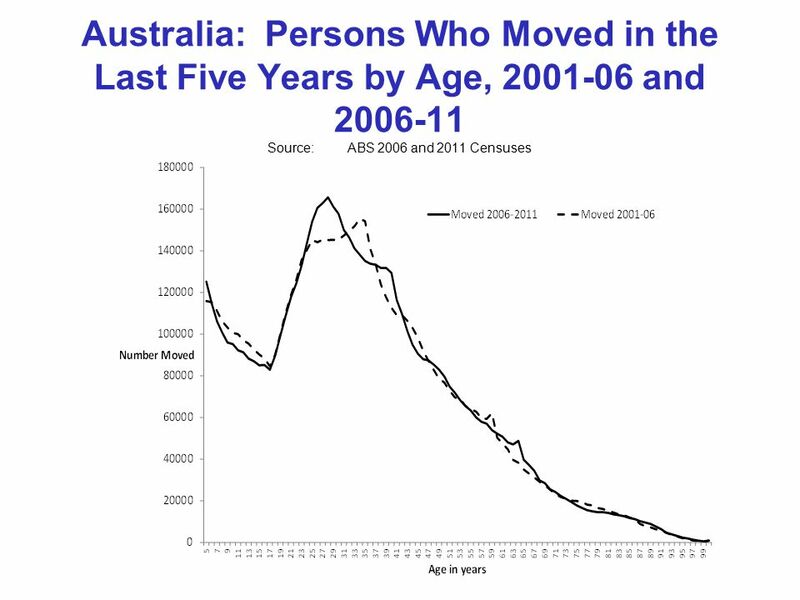 Voluntary trading down to more age- appropriate housing within metropolitan areas. 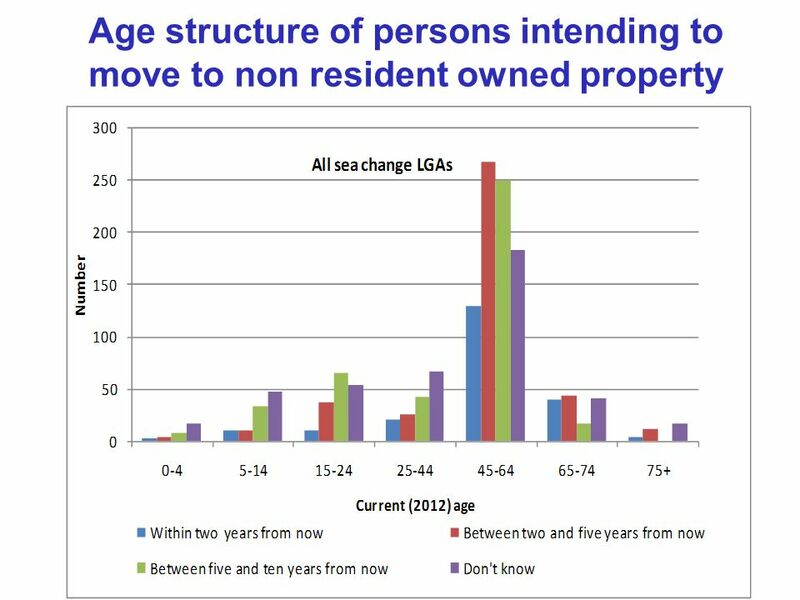 Involuntary trading down among renters and mortgage holders who are unable to keep up payments when they cease full-time work. 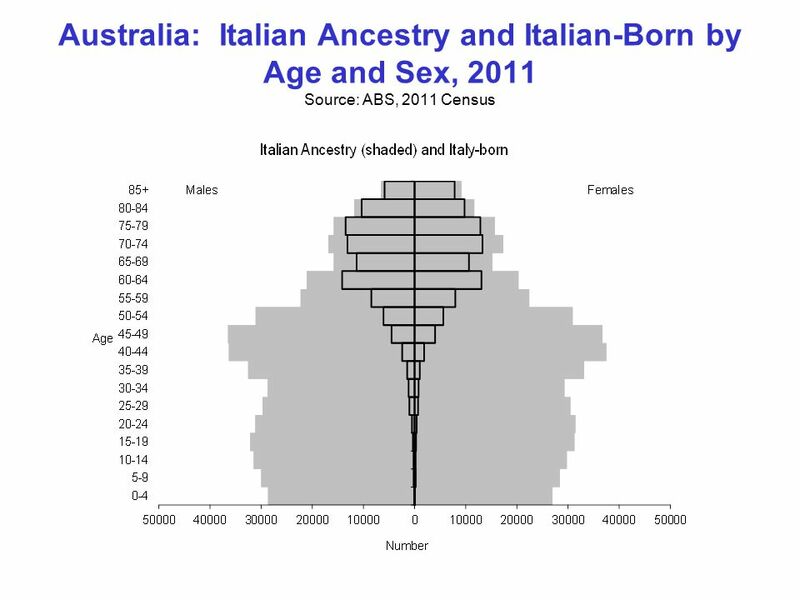 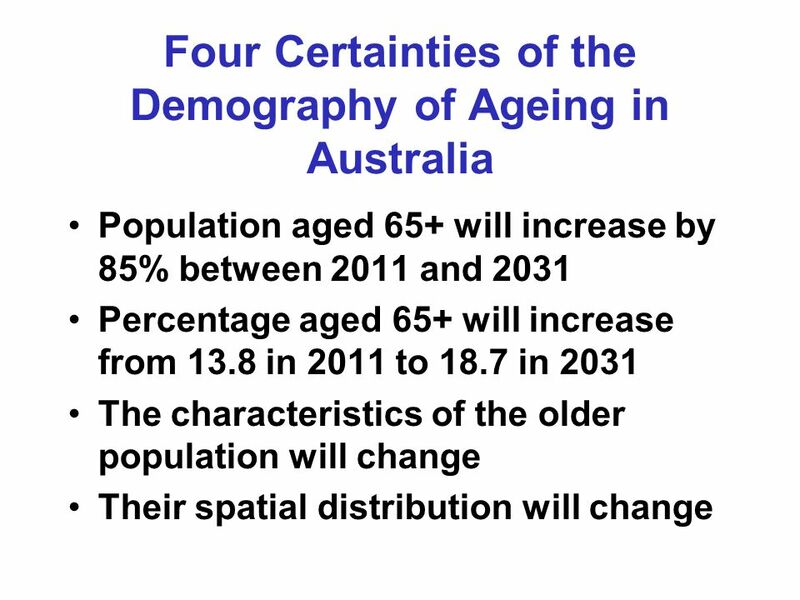 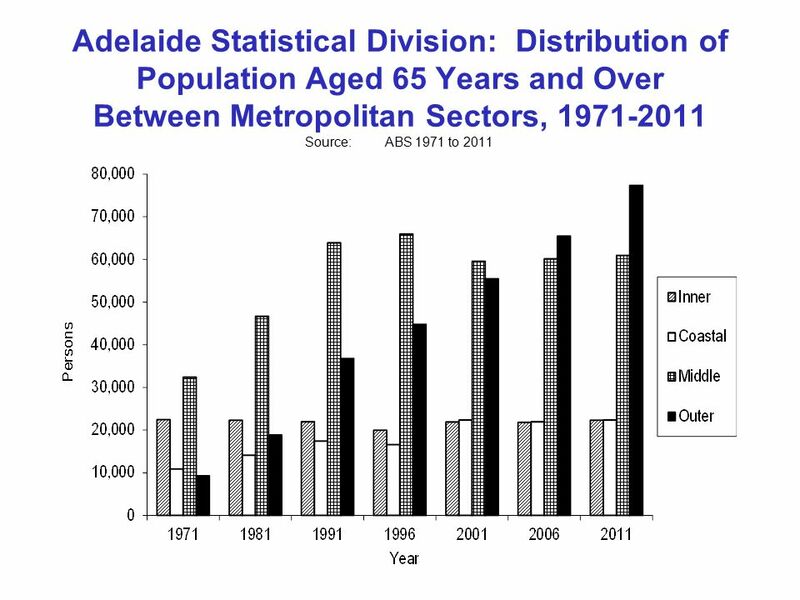 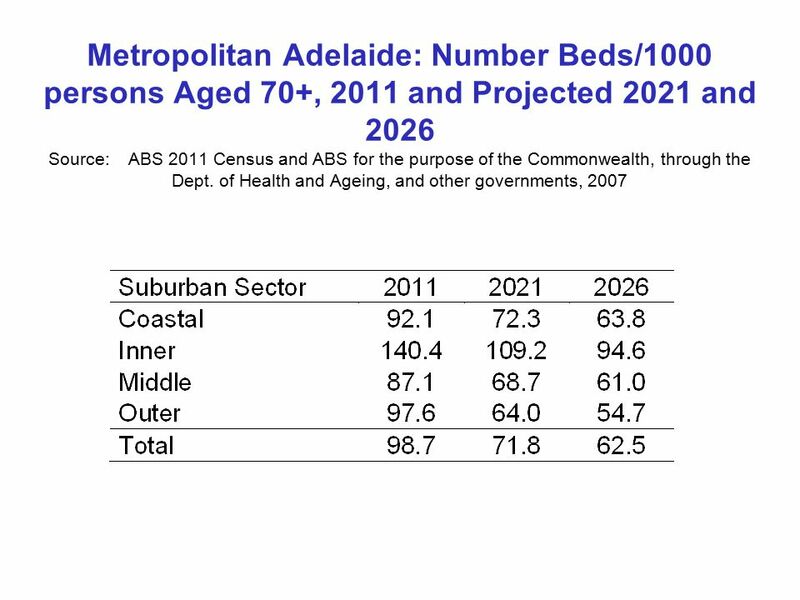 58 Conclusion Much of the material presented about Australia’s future aged population is fact rather than prediction, projection or estimate However some uncertainties… –How healthy will baby boomers be in old age? 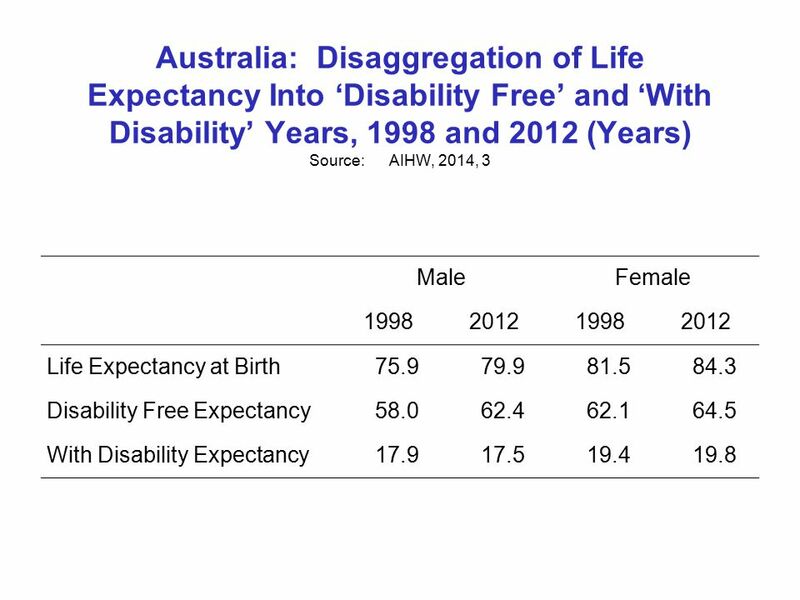 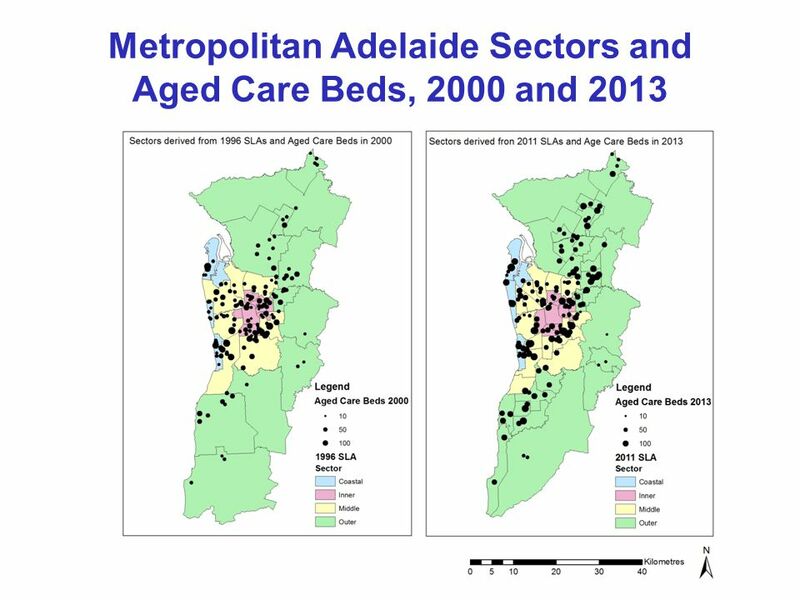 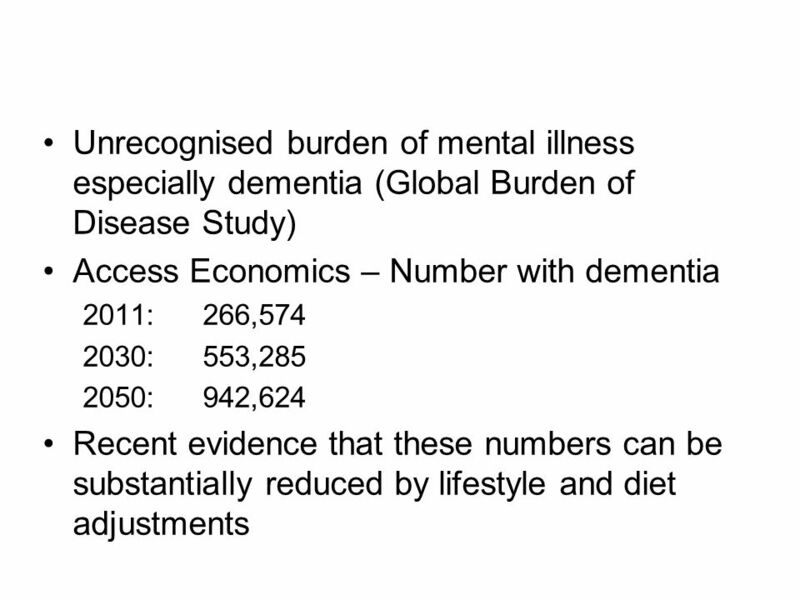 The signs are not good here but real efforts to reduce obesity among baby boomers could have massive dividends in improving their lives in old age but also substantially reducing demands on the health and aged care systems. 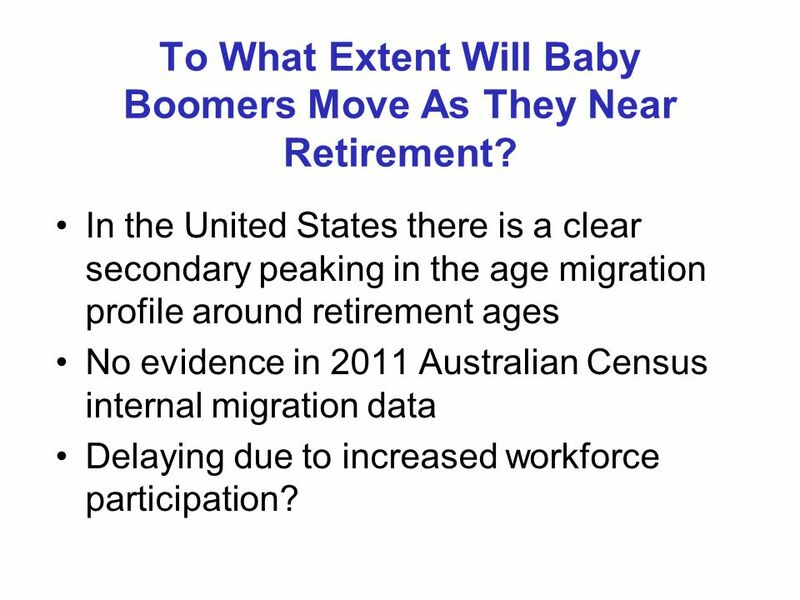 –How many baby boomers will move as they approach or enter retirement? 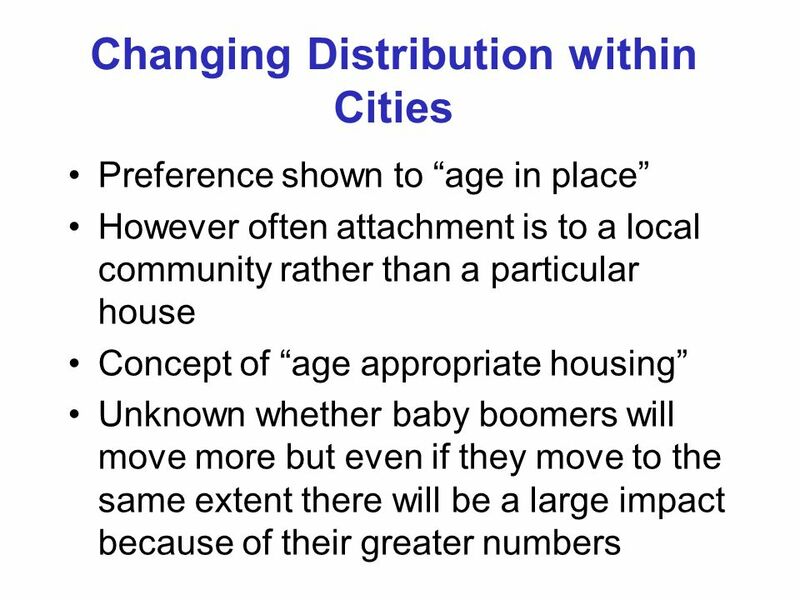 This will be influenced by whether or not they continue working into old age, the availability of alternative housing options, patterns of partnering among baby boomers, etc. 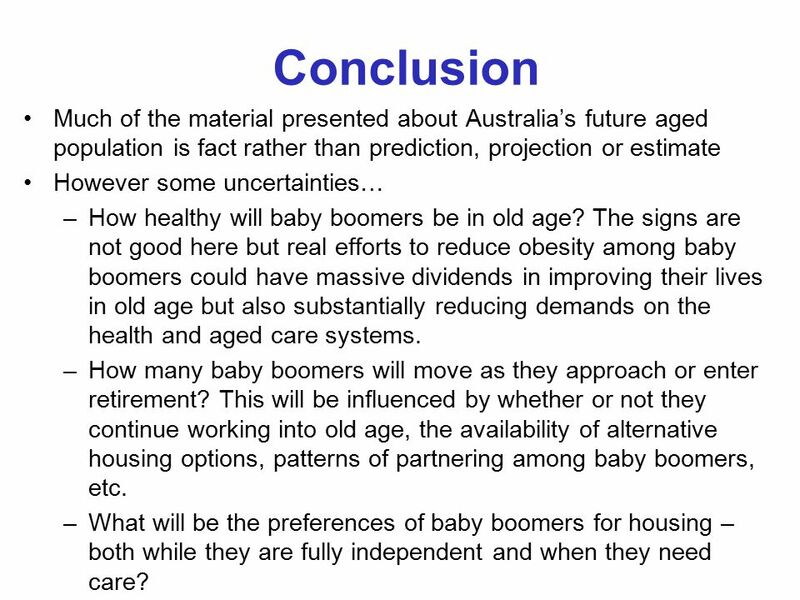 –What will be the preferences of baby boomers for housing – both while they are fully independent and when they need care? 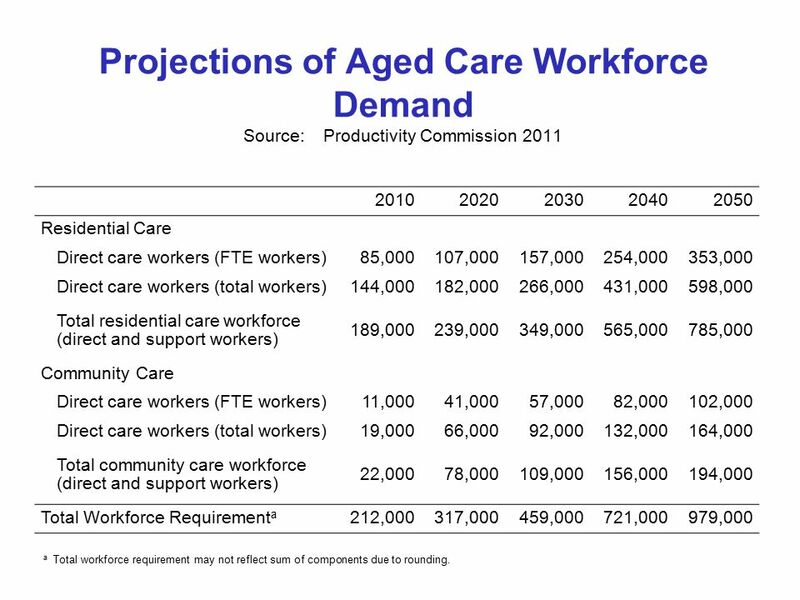 59 Projections of Aged Care Workforce Demand Source:Productivity Commission 2011 20102020203020402050 Residential Care Direct care workers (FTE workers)85,000107,000157,000254,000353,000 Direct care workers (total workers)144,000182,000266,000431,000598,000 Total residential care workforce (direct and support workers) 189,000239,000349,000565,000785,000 Community Care Direct care workers (FTE workers)11,00041,00057,00082,000102,000 Direct care workers (total workers)19,00066,00092,000132,000164,000 Total community care workforce (direct and support workers) 22,00078,000109,000156,000194,000 Total Workforce Requirement a 212,000317,000459,000721,000979,000 a Total workforce requirement may not reflect sum of components due to rounding. 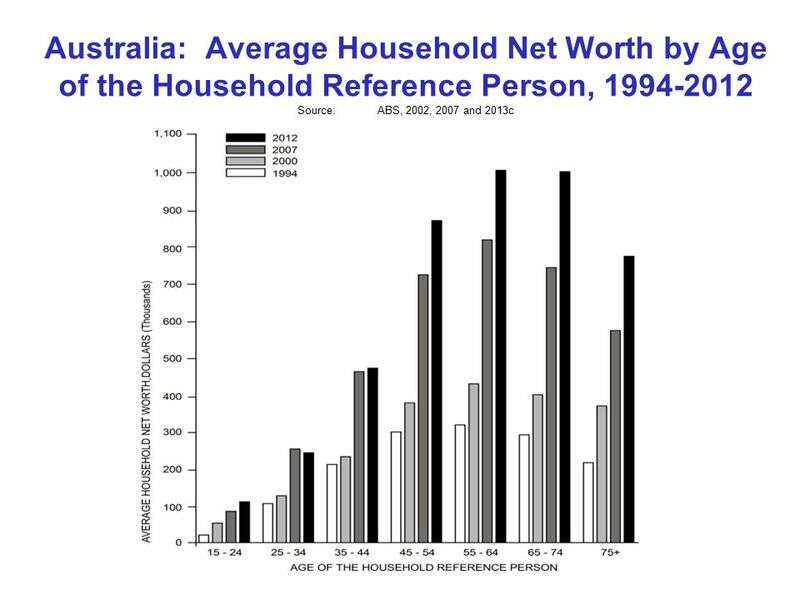 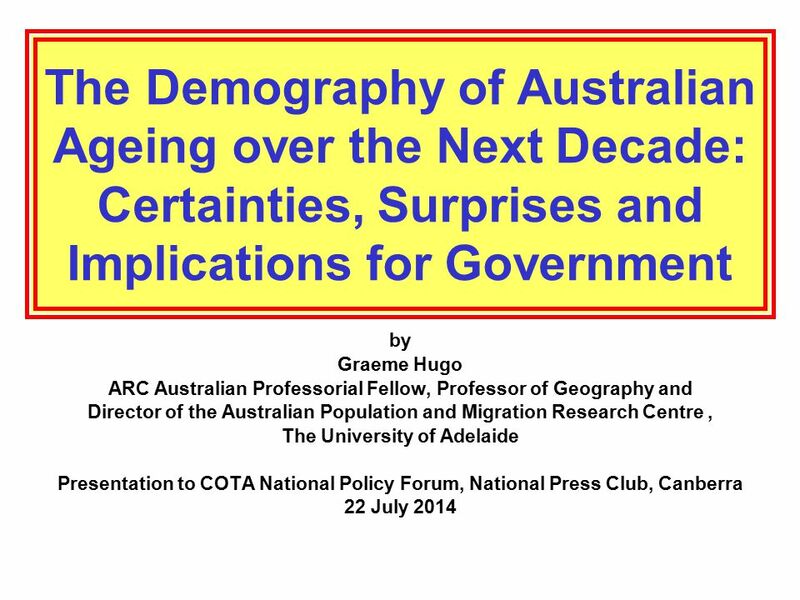 Download ppt "The Demography of Australian Ageing over the Next Decade: Certainties, Surprises and Implications for Government by Graeme Hugo ARC Australian Professorial." 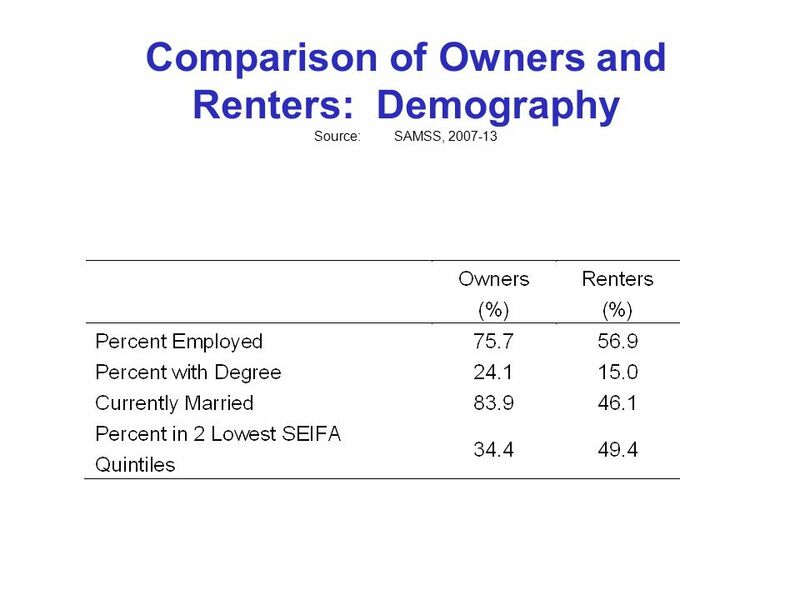 New England Regional Labor Force Developments and Their Workforce Development Implications Andrew Sum Center for Labor Market Studies Northeastern University.
. 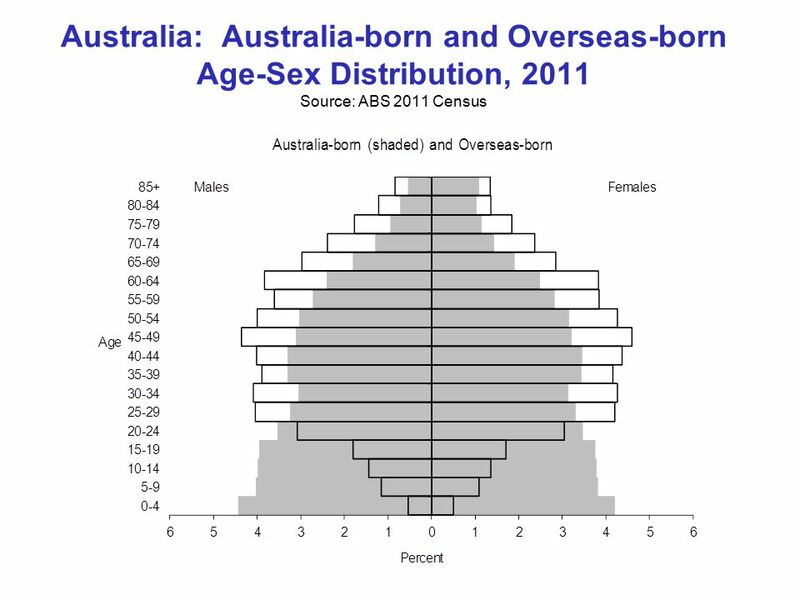 Copyright 2010 McGraw-Hill Australia Pty Ltd PPTs to accompany Strachan, French and Burgess, Managing Diversity 2-1 Chapter 2 Workforce diversity in. 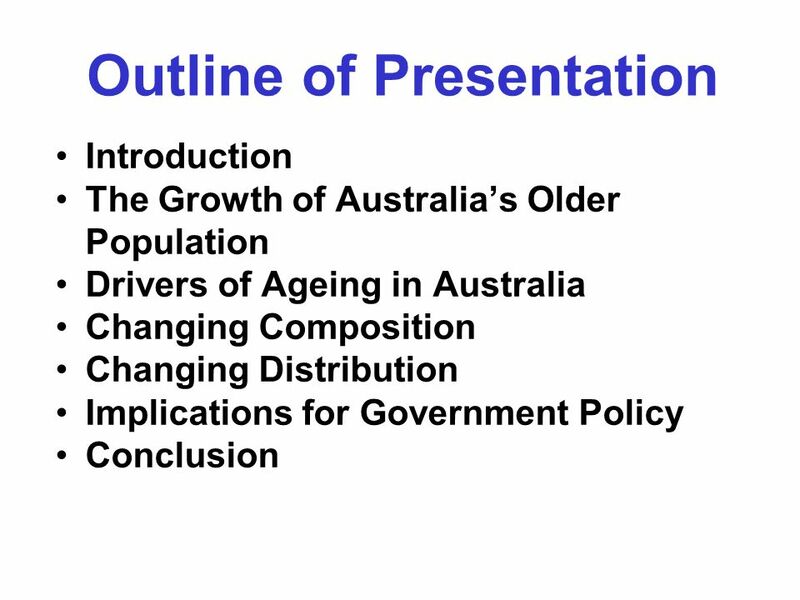 Australian superannuation: a statistical outlier OECD-ABS Workshop on Pensions Canberra Ross Clare, Director of Research, ASFA Wednesday, 24 April 2013. 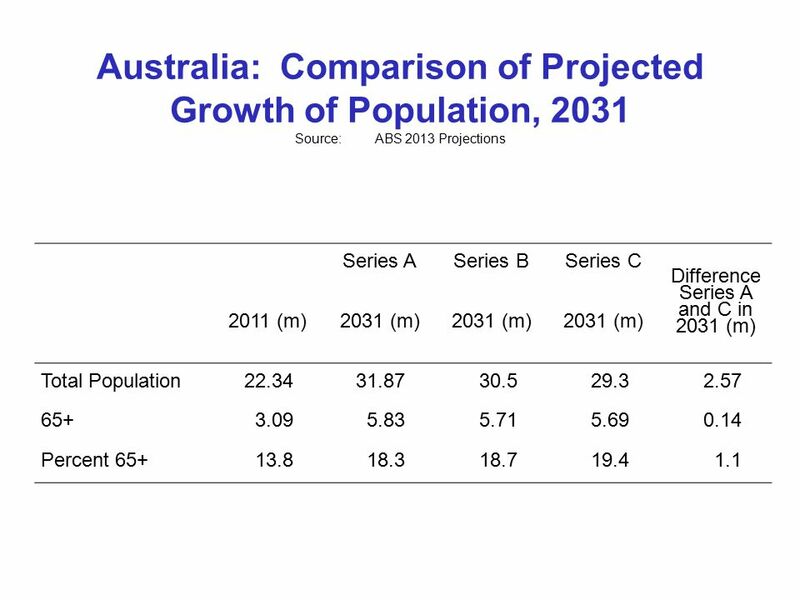 Australias Intergenerational Report Considering future liabilities of Government in a fiscal context 22 April 2013. 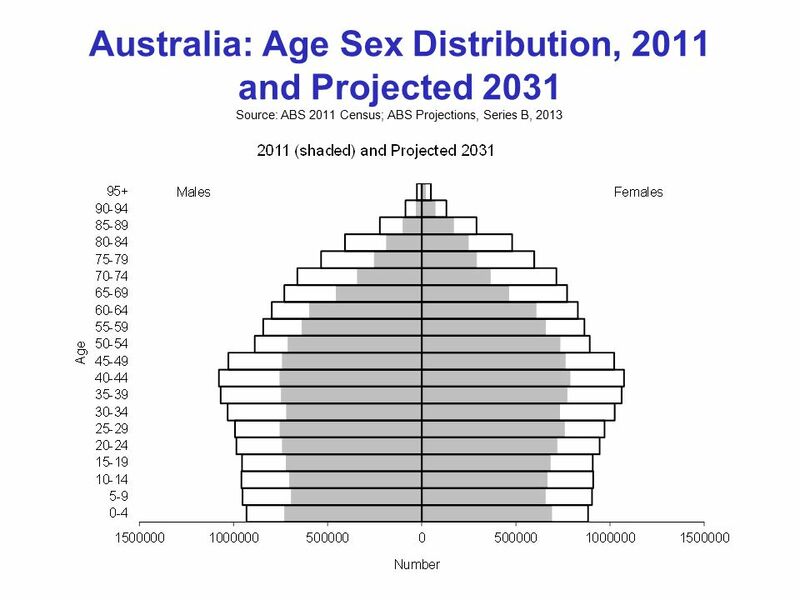 THE 2004 LIVING CONDITIONS MONITORING SURVEY : ZAMBIA EXTENT TO WHICH GENDER WAS INCORPORATED presented at the Global Forum on Gender Statistics, Accra. 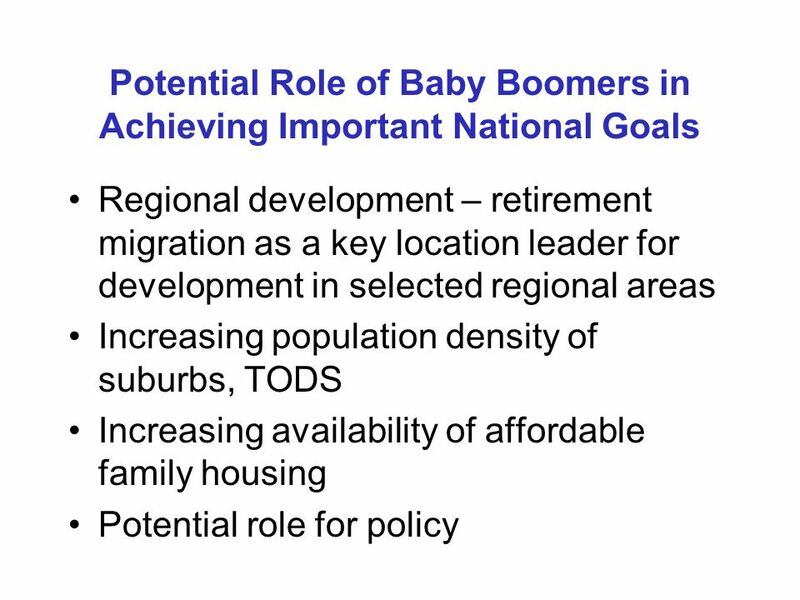 © 2006 POPULATION REFERENCE BUREAU Marlene A. Lee Senior Policy Analyst Domestic Programs 300 MILLION AND COUNTING Education and Workforce: The Critical. 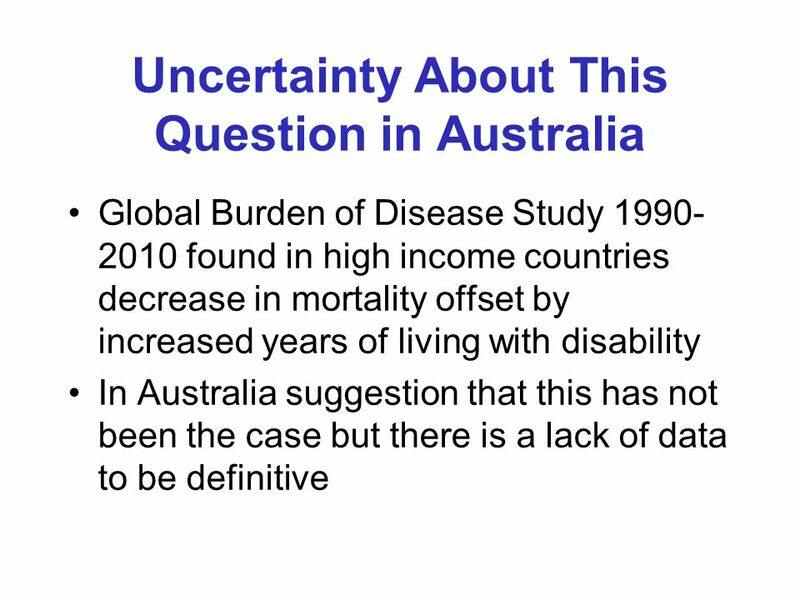 SECURITY MATTERS: HOW INSTABILITY IN HEALTH INSURANCE PUTS U.S. WORKERS AT RISK FINDINGS FROM THE COMMONWEALTH FUND 2001 HEALTH INSURANCE SURVEY CHARTS. 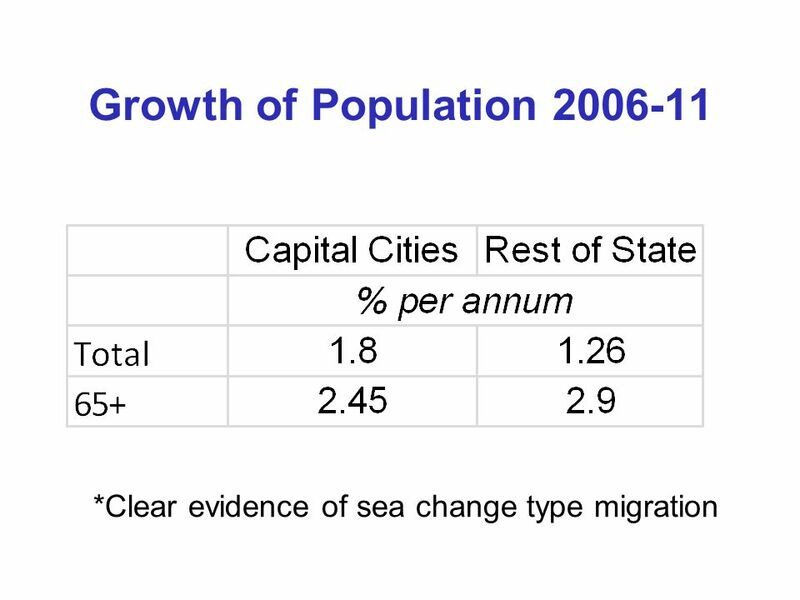 1Regional policy responses to demographic challenges, Bruxelles, January 2007 EUROSTAT regional population projections Giampaolo LANZIERI Eurostat. 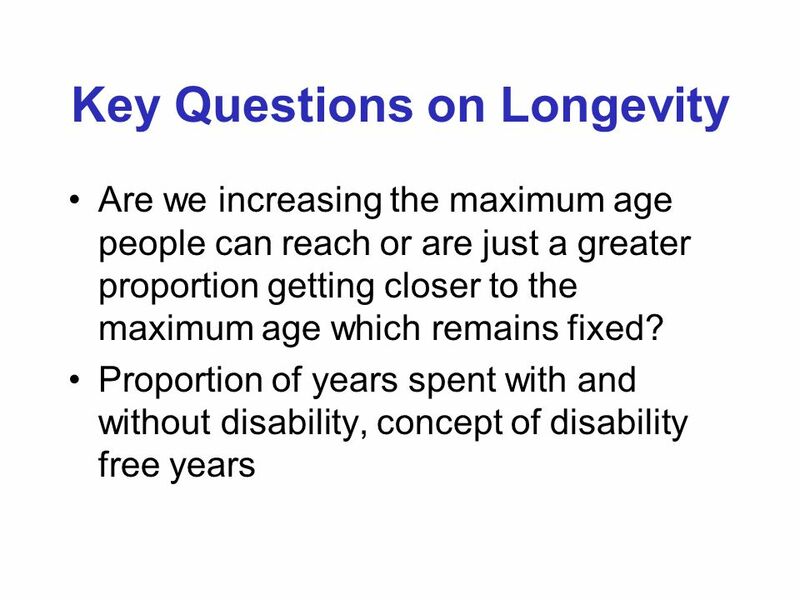 Gender and healthy ageing in Britain Emily Grundy, LSHTM, UK. 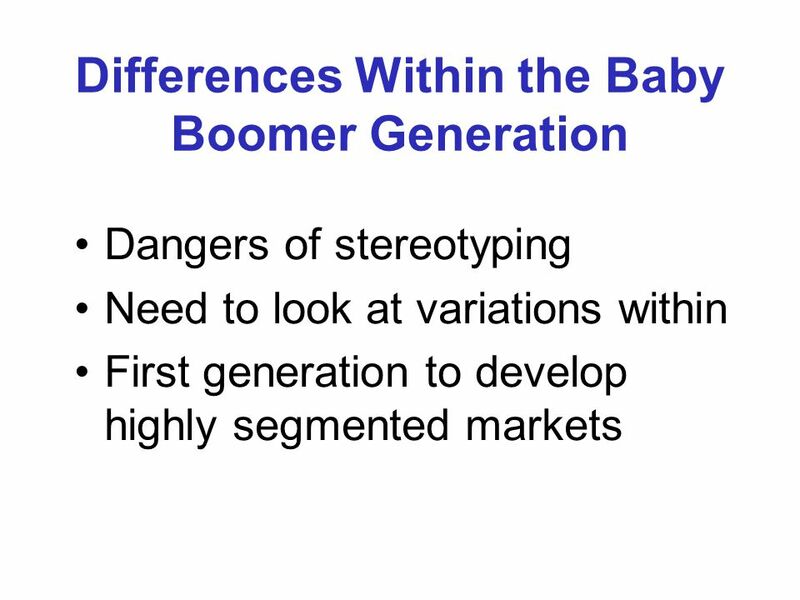 GeNET Seminar October 2005. 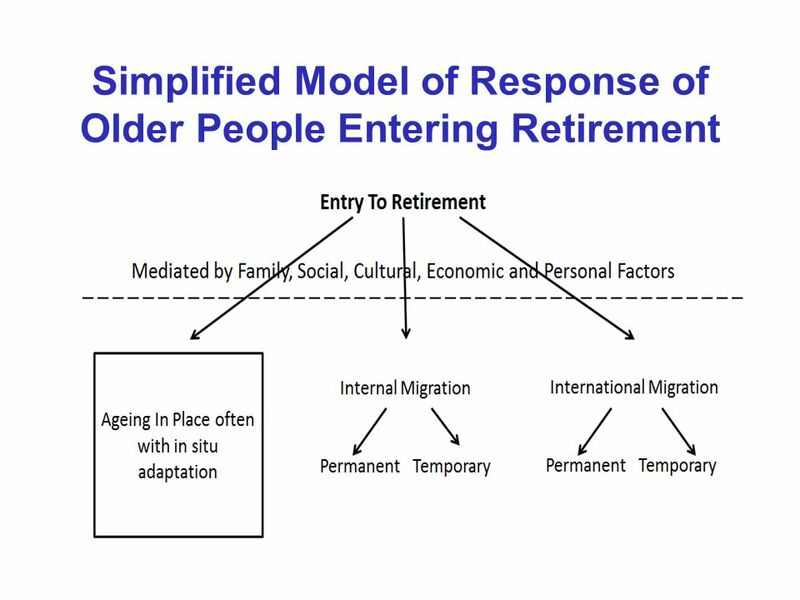 Transitions from independent to supported environments in England and Wales: examining trends and differentials using the ONS Longitudinal Study Emily.